Being at home with my family in Canada. Besides the 2 billion mosquitoes that live on just our property and how much we are missing Ben, it has been so great to be home. 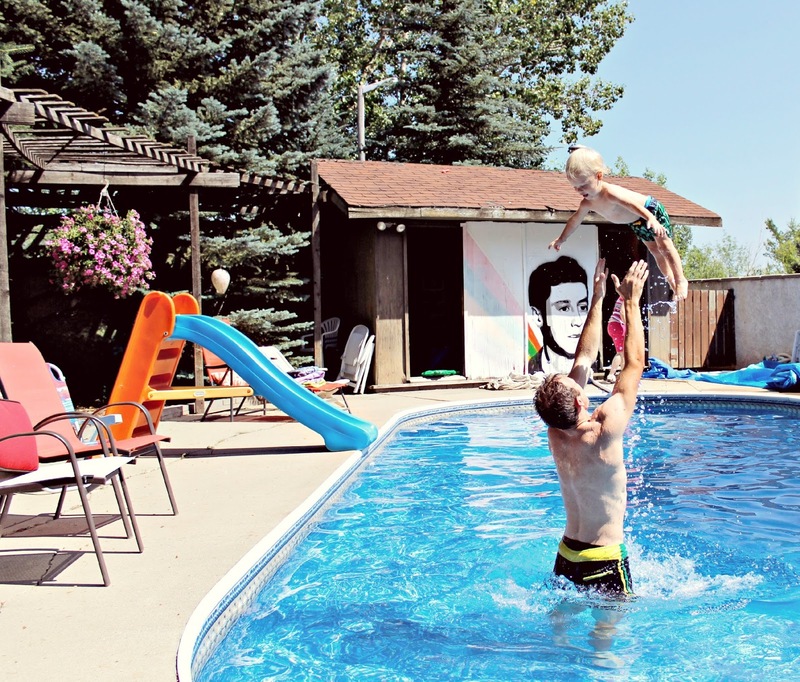 With a pool in the backyard, we don't have reason to leave the house much and we have been loving swimming every day, catching up with my cousins, BBQ'ing and I can't wait for the MacLennan Echo Lake Family Reunion next week. But really, we are missing the daddio, Uncle Matt is putting in the wrestling, skateboarding, swimming guy time with Everett in his stead. It feels like summer here and I am feeling refreshed and optimistic and happy. 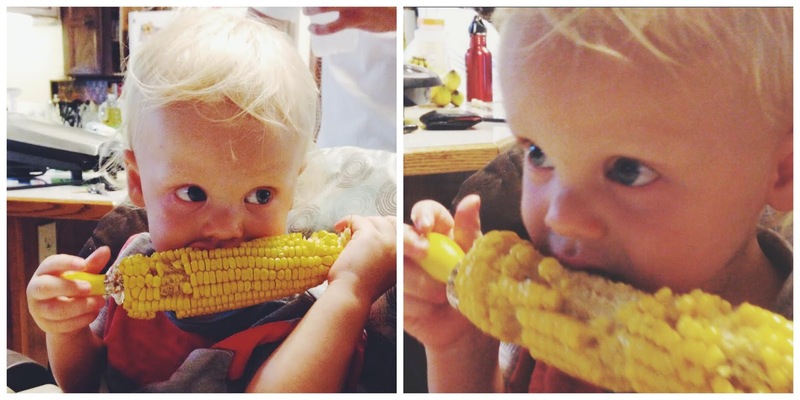 ^^^Nothing says summer like some Cob. His first time. Felicity. It is basically the generation before me's version of one tree hill, but not as soap-opery and more real (NOT One Tree Hill bashing-that show changed my life haha). I love Felicity so dearly already only two seasons in. It is the definition of a cozy, feel good show and it makes me miss the 90's, and want to get a perm and wear cable knit sweaters all the time. I seriously think it will be a series I watch over and over again. And for the record I am Team BEN! And of course The Bachelorette. Nick-woof! Frodo meets Pre-hot Neville Longbottom. He hasn't done anything seriously offensive or anything but there is just something ick about him. He is not funny, seems a little manipulative and talks like he has a retainer in constantly, not to mention all the infinity scarves. Josh-I have liked him from the beginning, despite my viewing company's dislike for him, I think he is sweet and happy and not hard on the eyes. I think he acts tough because he's nervous around her, but maybe unemployed? What's the plan Josh? I hope he wins. I loved Andi on JP's season, and I still do but her listening pout face is hard to look at and I hate when she says Y'ALL every second. I also think MARQUEL should be the next bachelor, he was the best! I know this is such a first world problem but I brought a bag of my 10 favorite nail polishes to St. George from California and they got lost in translation. (I am 99% sure airport security stole them) but if you know how much I love my nail polish, it has been pretty devastating! Also in the same bag was bumble a& bumble hair stuff and my Tweezermans. I cried. This was worse than my OPI massacre of 2010 where I dropped my nail polish bucket down the stairs and there was blood (polish) everywhere. We lost a few good ones that day, but nothing compared to this. It will be a rebuilding year for my collection I guess. Oh my goodness...Andi's listening pout face...it seriously drives me crazy! Definitely Josh all the way! I wish we were watching bachelorette together! Nick is the worst! He just feels skimy, cocky, and annoying! I do like josh, but I liked Chris more. I knew he wouldn't make it but he was so tend!!! And you nailed if with andi's pout listening face! It's so ugly! Ok tragedy About nail polish!!!!! 10 best colors!! That's not cheap! I bought a short story the other day and thought of you. Omg! You did whole 30! You look amazing! I've eaten 4 boxes of cocunut keeblers, 3 batches if homemade choc chip cookies, 2-3 bags of sour patch kids, haring gummies, Rita's and otter pops in the past 3ish weeks. BreAstfeeding has made me a sugar monster!! (More than before if you can believe it) I need inspiration!! Seriously come back already! FaceTime this week? Most important item of business first. Your nail polish. I am devastated for you, to the point where I almost shed a tear. And the fact it's happened to you twice is cruel. But I bet some security guard has some really cute nails. Third. Unrelated to post but to a comment. Jennica, I love that you can recite all the amounts of sugar you have had.